Hilarious. Fun. You'll be especially prone to like this one if you are at all a fan of Hank the Cowdog. 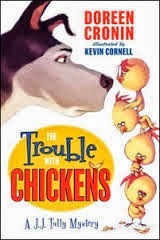 I purchased a copy of The Trouble with Chickens on a whim for Bookworm1. I thought he might like it. I saved it for his birthday (which was last week) and gifted it to him as his birthday read aloud. It was absolutely perfect. J.J. is a retired search and rescue dog who lives in the backyard of Barb (whom we never meet). He is yard mates with five chickens: Mama Moosh and her four balls of fluff. J.J. is approached by Moosh one afternoon with a request to help her find two of her missing chicks. J.J. accepts the job in trade for a cheeseburger which she agrees to. He begins his search and all evidence points to the idea that the two missing chickens are inside the house, being held prisoner by "Vince the Funnel." Vince is a dachshund with chronic ear infection who has to wear a cone. He's got a bad temper and a taste for chickens . . . if he could just get a hold of one without that dratted cone interfering with his business. J.J. and the chickens hatch a plan to get into the house and find the missing fowl, but things don't work out quite the way that they originally planned. Cronin has a pretty funny (in our opinion) sense of humor. We all chuckled our way through this very easy-to-read chapter book. The chapters are incredibly short and the book took about one total hour to read aloud. Happy birthday fare indeed! I personally found J.J. to be quite reminiscent of Hank the Cowdog. Good ol' Hank is not to be missed and is the original official-in-any-capacity dog that you are going to want to make friends with. As my kids have been exposed to Hank already, I didn't mind them spending time with J.J. (In other words, it won't interfere with their reading education. Wink.) I may or may not have given Hank's voice to J.J. as I read it aloud, because dogs who think highly of their personal careers sort of sound the same to me. If you decide to start with J.J., and your kids like him, then by all means plan on submerging them into Hank as they grow up. That said, we liked The Trouble with Chickens well enough to collectively agree that we'd like to search and rescue unto ourselves the second book in this series, The Legend of Diamond Lil . I predict another J.J. read aloud in our future. For now, just passing the word along. This is a fun one! J.J. actually reminds me so much of Hank that I had to see if Cronin had ever mentioned her inspiration for this story. I found this author interview which makes for an interesting read and confirmed that . . . Hank had nothing whatsoever to do with her. Hadn't heard of it, but I do own several of her others...Haven't read them in years which means it was before I paid attention to authors' names. This sounds like a hit! This one looks cute, though! It still looks a little too much for Grasshopper, but I'll keep it in mind for the future.